In this video we will discuss Quotename function in SQL Server. This is continuation to Part 145. Please watch Part 145 from SQL tutorial before proceeding. This function is very useful when you want to quote object names. Let us understand the use of this function with an example. The query that our dynamic sql generates and executes is as shown below. To see the generate SQL statement, use Print @sql. While both of the above methods give the result we want, it is extremely dangerous because it open doors for sql injection. So, the right way to do this is by using QUOTENAME() function as shown below. When we execute the above script we get the following error. SalesDB database is not dropped. The reason we get this error is because we do not have a table with name - [USA Customers Drop Database SalesDB --]. To see the sql statement use PRINT @sql. Invalid object name 'USA Customers Drop Database SalesDB --'. If we set @tableName = 'USA Customers', the query executes successfully, without the threat of SQL injection. 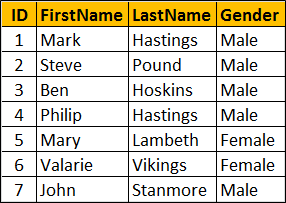 If you want to use sql server schema name "dbo" along with the table name, then you should not use QUOTENAME function as shown below. Takes two parameters - the first is a string, and the second is a delimiter that you want SQL server to use to wrap the string in. SELECT QUOTENAME('USA Customers','"') returns "USA Customers"
If you use a delimiter other than a single quotation mark, double quotation mark, left bracket or a right bracket, you get NULL. The following statement returns NULL. For some reason if you have a bracket in the table name, QUOTENAME function will double it to indicate an escape character. To remove the QUOTENAME use, PARSENAME() function as shown below.